The Boy Scouts are considering integrating girls into their programs. Here's why. 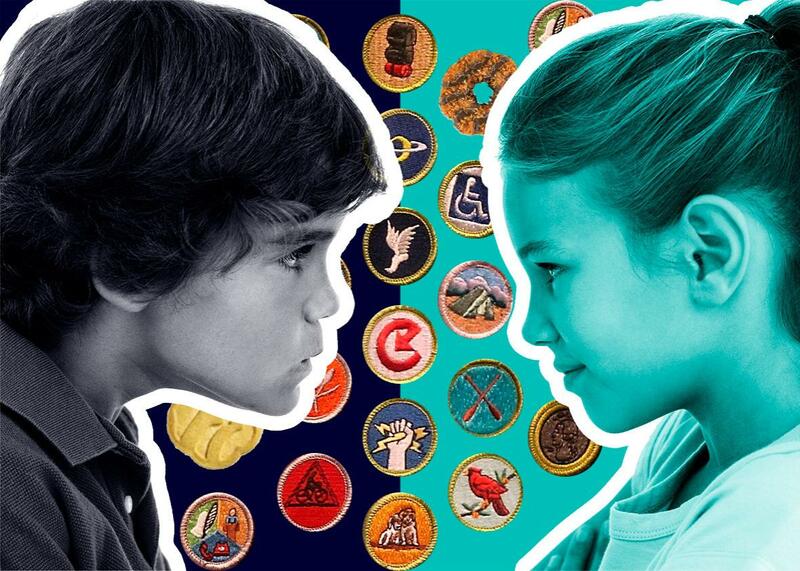 Why there’s never been more rancor between the Girl Scouts and Boy Scouts organizations. The Girl Scouts and Boy Scouts have two equal but different sets of expertise, each honed over more than 100 years of programming experience and research. Photo illustration by Slate. Photos by Justin Sullivan/Getty Images and iStock. Since the Boy Scouts and Girl Scouts were founded in 1910 and 1912, respectively, the groups have maintained an amicable relationship. For the most part, they’ve kept to their own affairs without reason for rancor. When local scouting councils interact, they’ve generally supported one another: Some share campgrounds, board members, and recruitment campaigns. In August, BuzzFeed published a letter from GSUSA President Kathy Hopinkah Hannan to BSA President Randall Stephenson in which Hannan accused BSA of launching a “covert campaign to recruit girls” into Boy Scouts–affiliated programs. For months, GSUSA had been hearing from several local councils that their Boy Scouts counterparts were recruiting parents into coed programming by saying the Girl Scouts wouldn’t be around much longer. Hannan wrote that BSA was “reckless” to entertain the idea that boy-tailored programming could be easily transferred to coed groups, accusing the organization of trying to bolster declining membership rates with another gender instead of the more than 90 percent of boys who aren’t involved in Scouting. “It is inherently dishonest to claim to be a single gender organization while simultaneously endeavoring upon a coed model,” Hannan wrote. Though BSA says it has no concrete plan to include girls in its core boy-only programs, it has been sending out feelers for some time. In a video published mid-August, Chief Scout Executive Mike Surbaugh unveils the results of a 2017 survey. Among Cub Scout parents, 85 percent said the curriculum is “relevant” for both boys and girls, and 68 percent said they’d want to enroll their own daughters. When parents of non-scouts were asked, without invoking the Cub Scout brand, if they’d register their kids of either gender in an identical program, 90 percent said yes. Surbaugh positions a potential BSA expansion into girl-centered programming as one solution to the organization’s stalled enrollment rates. In the video, Surbaugh attributes some of the decline in membership since 1995 to what he calls “controversy”—probably a reference to the organization’s old anti-gay policies and sexual abuse scandals. But the bigger challenge has been “structural changes that have happened with the family,” he says, particularly a decrease in parental free time, a major consequence of a growing population of mothers entering or returning to the workforce. “You can’t fight those trends forever,” Surbaugh says, claiming that today’s parents don’t have the time or desire to send kids of different genders to separate activities. GSUSA thinks that’s exactly the problem. “It’s well-known, well-documented: Boys and girls learn in different ways,” Mike Lopes, a GSUSA communications director, said in a phone interview. “Our concern is for girls. We really feel that to take a program that the Boy Scouts have … we know that it will not simply translate easily into girls. It seems more like kind of a quick fix rather than something that is really in the best interest of girls, helping them actually develop and become leaders.” Lopes thinks the Girl Scouts and Boy Scouts have two equal but different sets of expertise, each honed over more than 100 years of programming experience and research. Each was chartered by Congress in the early 1900s as an organization dedicated to the mission of single-gender education and character-building. There is some evidence that single-gender education may benefit girls even more than boys: A girl-only environment means girls are more likely to volunteer for—and be called upon to take—leadership positions because there aren’t boys to fill them. From a very young age, girls are attuned to stereotypes that cast men as more intelligent and capable than women. For several generations, GSUSA has been refining its programs to combat that hard-to-avoid sexist socialization. That’s what makes Surbaugh’s speech rather eerie: He doesn’t mention the Girl Scouts at all. It’s a blinding omission, especially in the segment where he wonders what opportunities might await girls after they age out of Cub Scouts, when boys would enter Boy Scouts. The obvious answer would be Girl Scouts, a century-old program that serves about 1.8 million girls. But BSA leadership is intent on keeping girls in the organization, if it decides to admit them at all. The only options Surbaugh presents are finding a girl-focused partner organization with “shared values” or inventing a new, BSA-run scouting program for young women. The social and familial changes Surbaugh worries about have dovetailed with BSA’s current financial challenges, which are only partially related to stagnant enrollment. A report on the organization’s 2016 finances from BSA Treasurer Joseph P. Landy shows a $34.5 million decrease in total net assets in 2016, compared to a $25.5 million decrease in 2015. Expenses also increased by $21.5 million in 2016, largely because of “pension and insurance costs,” according to the report. BSA has stockpiled money in a “General Liability Insurance Fund” to secure the organization against such claims. The organization spent $70.9 million on insurance in 2016, excluding premiums, up from $40 million in 2015. The insurance reserves only rose $28.1 million in 2016—to $180.7 million from $152.6 million in 2015—suggesting that the organization paid out somewhere around $42.8 million from its insurance program in 2016. Some of these millions may have gone to sexual abuse complainants. “The National Council has been named as a defendant in several lawsuits alleging inappropriate conduct by local council employees or Scouting unit volunteers, including allegations of conduct that did not occur within Scouting and allegations of incidents dating as far back as the early 1960s,” the 2016 report says. “The National Council is also aware of threatened and expanding litigation of a similar nature.” The report also says that current and future sexual abuse lawsuits “could have a significant impact on the financial position or results of operations of the National Council” if the general liability insurance fund isn’t enough to pay all the necessary damages. The Boy Scouts of America has seen a dramatic increase in liability lawsuits which has decreased our movement’s financial position by between $40 to $50 million annually since 2010. An increase in the annual membership fee is required to financially stabilize our movement. All of the funds generated from the increase will go directly to the National BSA General Liability Insurance Fund. A Boy Scouts spokesperson told me that this increase “was considered partly to address decades-old claims, as well as to ensure the sustainability of essential support services we offer to councils.” Lopes, meanwhile, says that the ongoing sexual abuse allegations are another reason to be skeptical of BSA’s reasons for considering the admission of girls. “The desire to make sure girls are safe is very prevalent on our end. We don’t have a large defense fund,” he said. “When there’s so many boys out there not being served … it’s disconcerting to think—it’s just being done a little fast and a little recklessly without necessarily taking into consideration what’s best for girls and their safety.” Of course, GSUSA has a major interest in keeping BSA from starting its own version of the Girl Scouts. There are a few competitors in the girl scouting marketplace—the Christian conservative American Heritage Girls is one—but BSA is a recognizable brand with an equally long history, making it a far more formidable potential threat to GSUSA’s own declining membership rates. Lopes says his organization has no concrete plan for what to do if BSA starts encroaching on its territory, but he expects membership and financial projections informed by this week’s triannual GSUSA convention to come out sometime in the next few months. There’s a lot of young women and a lot of young men who are Eagle Scouts that tell me “If the girls work just as hard, they ought to be Eagle Scouts.” I think there are others that would say “This is one of the last things that boys have in America is the Eagle Scout.” We can do nothing to harm boys. We need to maintain the integrity of that Eagle rank for boys. Though there are some girls who say they’d rather join the Boy Scouts because they like the focus on wilderness survival and the prestige of the Eagle Scout rank, GSUSA advocates assert that girls can do anything they could do in Boy Scouts as members of Girl Scouts. Obviously, girls deserve the same opportunities as boys. But it’s an open question whether the best place for them to exercise those opportunities is in an organization that seemingly adds girls as an afterthought to shore up membership and finances. No matter how hard BSA works to integrate girls, some members will always believe the Boy Scouts belongs to boys.